At this point, the best word to describe Kobe’s game is crafty. He has lost a lot of the top-flight athleticism that once made him the most explosive scorer in the league, but through sheer force of will and veteran guile, he remains the best 2-guard in the game. Watching Kobe, you can just tell he works much harder than any other player in the NBA. The best post-up guard in the league, he no longer drives to the hoop as much as he once did, but rather kills you with midrange jumpers and post-up turnarounds. 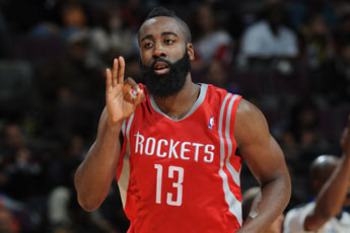 Harden is a gifted pick-and-roll player, be it as a scorer or passer. He can use his bulk (and beard) to get into the paint, and if the defense collapses he can just kick it out to a shooter. If they do not, he will bully his way into the paint and probably get fouled or finish. Add to that his great touch from outside, and you have a very complete offensive player. Defense… not so much. D-Wade used to use his quickness, jumping ability, and uncanny body control to get to the bucket whenever he wants. The body control is still there, but his ups and quickness packed the bags and left town. Now you have a guard who plays a lot like a forward, relying on post-ups and his sheer strength to draw contact and finish at the rim. 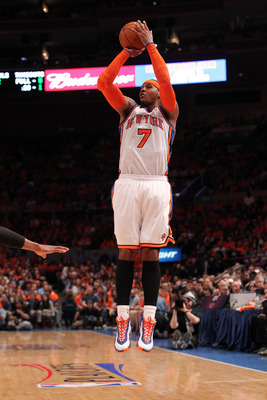 Never had much of a midrange game or outside shot, so it will be interesting to see him continue to age and adapt. I am as surprised as you that Manu is this high, but that is how weak the position is nowadays. Manu combines a relentless approach to the rim with a smooth outside jump shot and savvy passing to make a refined game that is tough to handle. Tends to take over games in the 4th, when his deceptive moves cause defenders fits. His playmaking and ability to score of the dribble is invaluable to the Spurs. Slowing down a bit of late, but he has the skill to prove that his hot start is no mirage. He is a great outside shooter, be it running off screens, shooting off the dribble or the catch and shoot. He is also deceptively good off the dribble, and has crafty moves to finish at the rim, making up for merely average athleticism. A good and willing passer who can run a nice pick and roll. The best player in the game. He does everything you could possibly want from a basketball player. He has improved his outside shot, is unstoppable in the open court, may be the best passer in the league, and is an imposing defensive force. His versatility on both sides of the ball makes him a nuclear grade weapon for the Heat. If you want to nitpick, he certainly could improve as a free throw shooter. His combination of length, underrated athleticism, and shooting touch make him a nightmare for opposing defenses. He is always open for jump shots because he can simply shoot over the defender. Has made huge strides on defense, and if he fills out a bit he could become a two-way force, shutting down the best player on the other team and scoring at will. Much improved as a passer. As skilled a scorer as any player in the history of the NBA. Has a deadly midrange game, but also is not afraid to get in the post and use his size to impose his will by scoring or grabbing tough rebounds. Does not move the ball well, but this has been mitigated by the great ball movement by his teammates. Does whatever it takes for his team to win. Has an ugly game that is centered around using his body to create space on drives, and then jumping right into his defender to draw the foul. A great midrange shooter who can get his shot whenever he wants. Also a marvelous passer and above average rebounder, who is not afraid to play lockdown D.
A freak athlete in a league full of freak athletes. A 6’10” player with a shooting guard skill set, hitting threes with ease and also able to drive to the rack. A defensive force who can lock down any non-center. Does not have a great handle, and needs to develop a post-up game to take advantage of his prestigious height. In the next post, the Power Forwards and Centers are ranked.